When it comes to news and documentary shooting there is something to be said for a camera that one can just pick up and start shooting. Panasonic’s impressive new AG-DVX200 is the first of new generation of run-and-gun 4K camcorders that meets that need with features to spare. The DVX200 features integrated optics; ease of operation, a deep feature set, and the package comes at a reasonable price. The camera is a dream come true for non-fiction, documentary, and unscripted applications. Until now we haven’t quite been able to do that yet with a compact large sensor camcorder, but we now can with the DVX200. For sure there are shooters and producers of television programs for whom the DVX200 will hold little appeal. These folks - and maybe you’re one - will only consider a 4K camcorder fitted with an interchangeable lens. For these shooters of mostly narrative higher-end commercial fare, there is already a long list of 4K/UHD cameras from manufacturers like Sony, Canon, JVC, Blackmagic, and others, from which to choose. 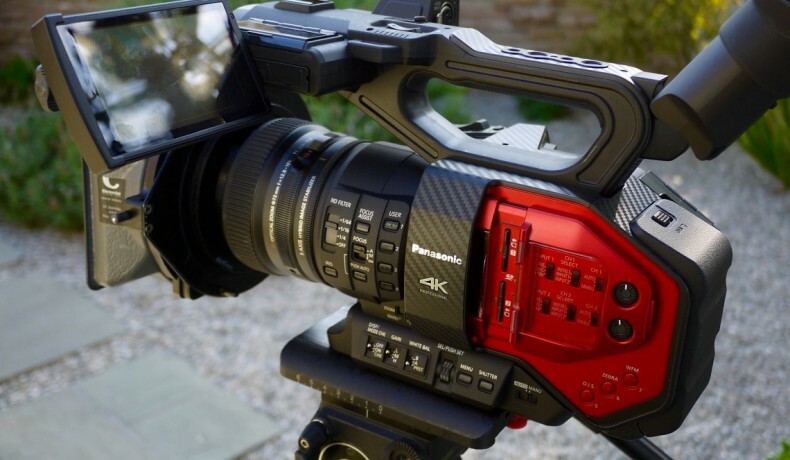 The Panasonic AG-DVX200 is the most powerful mid-range camera the company has ever produced. For ENG, travel programs, and unscripted reality shows, the DVX200 is close to ideal. Upgrading DSLR shooters will no doubt marvel at the DVX200’s vast high-end capabilities - and be confounded by them. Even so, the camera’s menu structure is unnecessarily convoluted and dense. 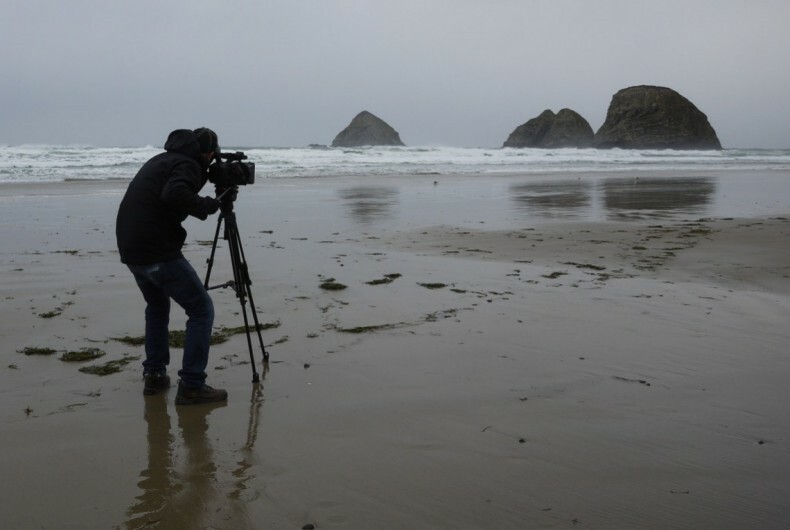 Author Barry Braverman using the DVX-200 on the Oregon coast. So why consider the Panasonic DVX200 with a creativity-stifling non-interchangeable lens? Because unless you are shooting primarily for digital cinema, professional sports, or wildlife, and are willing to invest in a pricey top-of-the-line camera with precision optics, the DVX200 with its versatile high performance integrated 13x zoom makes a helluva lot more sense. The DVX200 features an integrated 13X F2.8-4.5 lens. Such a high magnification zoom is unusual in a large-format 4K camcorder. Truth is, for most of us toiling daily in the broadcast industry we earn our living in the non-fiction arena, shooting unscripted magazine and reality shows, news, and documentary fare. For these types of programming i.e. the ones by which we actually earn a living, the DVX200 with integrated optics is very well suited. One can shoot macro close ups of spent shell casings on a bloodied sidewalk one minute then a shallow DOF interview with a displeased politician the next. The DVX200 touchscreen offers a broad choice of resolutions and frame rates in addition to fine control of gamma, color correction, matrix, among other professional parameters. Of course most feature films demand a higher class of camera like Panasonic’s flagship VariCam 35. But top-end cameras aside, the DVX200 at $4695 MSRP performs much better, produces sharper pictures, and is more versatile than any other similarly priced 4K camcorder (or DSLR) on the market. Still quite understandably, many shooters will demand a camcorder with the capability to mount long, short, wide, or whatever optics they desire, as the need and job arises, and at first glance this requirement seems reasonable. However we know from industry research, especially for broadcast applications, that only a small percentage of shooters actually take advantage of their camera’s interchangeable lens capability. For most shooters of documentary, unscripted, and non-fiction programs, the ability to swap lenses is hardly worth it, given the practical very real performance compromises that tend to go with it. The fact is most modern camcorders with fixed lenses perform much better than similar-class camcorders with interchangeable optics. 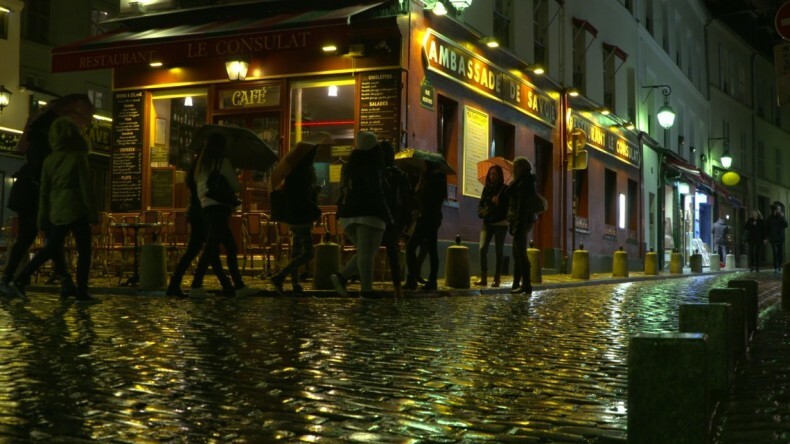 Panasonic was the first major camera manufacturer to offer Chromatic Aberration Compensation (CAC), an onboard optimization strategy implemented via software to reduce the visibility of chromatic aberrations in (supported) interchangeable lenses. By all accounts chromatic aberrations (most prominently seen as a prismatic effect around specular light sources) are the main reason low-cost lenses look cheap. 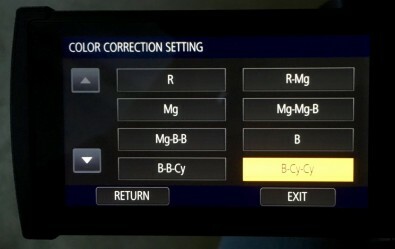 Color corrector menu. The DVX200 touchscreen offers a broad choice of resolutions and frame rates in addition to fine control of gamma, color correction, matrix, among other professional parameters. The DVX200’s high magnification 13x zoom is currently unique among compact 4K camcorders. The integrated lens produces very sharp images free of significant artifacts even when fully zoomed in and at maximum resolution. The breathing of focus, barrel distortion, tracking errors, chromatic aberrations, and other common defects that shooters would normally expect to see in an economical lens, are digitally mapped out and corrected in-camera. The result is surprisingly clean pictures with a classy look and feel, not at all typical of an economical camcorder. Providing optimal optical performance is one thing but the zoom’s servo-controlled floating rear element also allows remarkable versatility including a nifty close focus capability to the lens’ front surface. This kind of flexibility is simply not achievable in a low- or mid-level camcorder fitted with interchangeable optics. The DVX200 with the latest firmware serves up very low noise 4K images. This is due in part to the camera’s latest generation 4K (actually 5K) sensor, which is inherently low in noise. The 4/3-type MOS sensor is unique to the DVX200 camera and not repurposed from the Lumix GH4 or earlier generation still cameras. Like the Lumix GH4 the DVX200 records true 4K 4096 x 2160 pixels. To achieve this large frame size the camera’s native 13.5Mpx sensor captures a 5022px horizontal sample that is subsequently downscaled to 4K, producing images that are wickedly sharp with a concomitant reduction in noise realized in the process. While the DVX200 exhibits very little shutter skew, especially in FHD 1920 x 1080, the v1.25 upgraded firmware nevertheless adds a FAST SCAN recording option. The thinking goes, given the camera’s large sensor and 4K resolution, some skewing or jello effect may still be visible however minimal in some critical applications, like shooting out of helicopters and out the side of moving cars. The FAST SCAN option is only applicable however to UHD recordings at 24/30/60FPS; the benefit of FAST SCAN being most apparent at 24FPS. At higher frame rates the skewing is inherently less of an issue due to the higher read speeds from the sensor surface. Also FAST SCAN utilizes a reduced 9Mpx (UHD) scan so images are not quite as sharp as the 5K native sensor recording DCI compliant 4K (4096px). Updated with the latest firmware the DVX200 exhibits much lower noise with significantly improved edge enhancement, the combination being especially evident in the deep shadows. By any objective measure the DVX200 legitimately offers twelve stops of latitude when shooting log i.e. V-LOG-LITE. Seeking maximum picture detail, many shooters of narrative fare like soap operas may prefer to shoot in log. However, there are drawbacks with respect to normal viewing and the associated workflow. Most imaging functions like black pedestal and gamma are not accessible and noise reduction is not applied in camera. The proper setting of black level and contrast along with any noise suppression must be applied later in post-production complicating the finishing process and potentially impacting delivery times. The DVX200 V-LOG-L follows a sensiometric response curve nearly identical to the log function in the VariCam 35. The less sophisticated sensor in the DVX however runs out of steam at only 12 stops whereas the VariCam extends the curve much further out to 15 stops or more. So while the log functions of the two cameras are identical, the LUT table as applied in the VariCam will not produce the same results in DVX200. The latter model realizing only eight stops of exposure latitude on the dark side and four at the top end. Unlike Panasonic’s venerable P2 cameras the DVX200 does not require serial-arrayed proprietary media. Instead the DVX utilizes ordinary SD cards. Recording 4K internally, most shooters and television facilities will find the low-cost SDXC media to be very compelling as spare cards are readily available at any Walmart, Asda, or even the neighborhood chemist. Appealing to low- and mid-market broadcast facilities, the DVX200 does not record in a proprietary format like XDCAM or P2. Instead DVX shooters simply choose .mov or .mp4 as a file format, (or AVCHD) depending if one edits on a Mac or PC, and that’s it. News and documentary shooters requiring a fast turnaround can take solace in the camera’s simple workflow that requires no transcoding or deciphering of cryptic MXF files. Of course given the lower-cost SD recording media there is some trade-off in performance. The 4K recorded internally is 8-bits long GOP at 4:2:0 resolution. While many purists will object to the loss of image quality, bear in mind that the DVX200 actually sells for less in constant dollars than the DVX100 camera back in 2002. 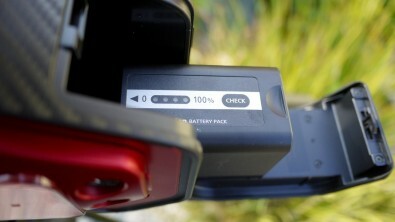 The camera battery can be changed easily and quickly via the rear drop down door. The camera has enough horsepower to record 4K at a relatively generous 100Mbps VBR (variable bit rate) at 24.00FPS. The integral frame rate seems rather odd at this point in history especially in the realm of broadcast. While 24.00FPS ensures best compatibility for digital cinema, the capture of video images at 24.00FPS does present potential pitfalls for television facilities. The mathematical complexity of converting 24.000 video to 23.976FPS can lead to serious artifacts and a significant loss of quality. The trailing audio must also be slowed down, a less traumatic process perhaps but nonetheless requiring an additional step. Suffice it to say that TV facilities in Europe will almost exclusively shoot UHD 25FPS and forego the 4K option entirely. The DVX200 records all I-frame UHD 3840 x 2160 at 23.976, 25, and 29.976FPS at bit rates of 100Mps and 150Mbps. The non-proprietary all I-frame option must not be confused with Panasonic’s P2 AVC-Intra format that requires the much higher-speed P2 cards. Many doc, ENG, and unscripted shooters, will opt to shoot FHD 1920 x 1080 and record at the camera’s highest bit rate setting: all-I frame 200Mbps. The setting is processor intensive, which is why some shooter’s claim to see better image quality at 100Mbps utilizing long GOP. It seems counterintuitive to see better results at a lower bit rate (in long GOP no less), but the reduced bit rate recording does not incur as heavy a data load and thus less prone to playback anomalies. For DVX200 shooters working primarily in UHD and 4K the high data loads may point to the need for a faster computer and NLE platform. It may also be sufficient reason to convert to ProRes for smoother playback, depending on the editing platform. The DVX200 also has the unique capability to record .mov/mp4 FHD to its secondary recorder at 50Mbps or 8Mbps proxies. AVCHD recording is supported as well at a wide range of bit rates up to 28Mbps in addition to standard definition. Alas there are so many choices! Barry Green’s comprehensive "Guide to the Panasonic AG-DVX200 camcorder", is available free from the link shown in the article. And therein lies a potential rub. Many new shooters with little prior experience in professional video may feel lost wading through the bewildering number of options. Given the range of choices for basic operation, frame rates, scene files, and compression, a solid grasp of the camera’s capabilities is imperative in order to take full advantage of this remarkable camera. 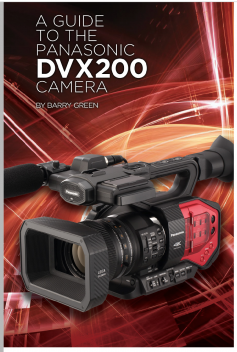 Thankfully we have Barry Green’s comprehensive God-given tome, Guide to the Panasonic AG-DVX200 camcorder, as the ultimate guide, which is available as a free download. Ultimately broadcast facilities must consider what they want the camera to do because the camera can pretty much do it all—and then some. Take for example a rather kooky new DVX200 feature called Background Recording. Not seen previously in a professional camcorder it works something like this: When powering up the camera’s Card #2 automatically goes into record, as Card #1 then records clips sequentially in the usual way. Panasonic suggests that Background Recording is ideal for events like awards and event ceremonies where distracted (or possibly inebriated) shooters might miss critical action. The obvious question becomes then: Isn’t this what Pre-Record is for?’ And oh yes. The camera also offers Pre-Record, about 3 seconds in FHD. There is no PRE_REC option at the higher resolutions however – c’mon the camera does have its limits. For ENG and news shooters the camera is very fast acting. Pull the DVX from a shoulder bag and we’re ready to roll without fuss or fumbling, or unnecessary intrigue. Before the DVX200, this level of ease of operation was simply not available in a compact 4K camcorder regardless of price. Ergonomically the DVX200 is well balanced owing in part to the camera’s newly designed base plate, which serves as a stabilizing wedge when pressed against the operator’s body, and on that account the camera is also lightweight. At a mere 3.1 kg (6.8 lb) it is no lead sinker, and thus not suitable as ballast on wind-tossed seas. And speaking of which, when shooting handheld in such conditions, the DVX200 features a remarkably effective image stabilization system. For reality TV shooters working primarily in unscripted environments, the camera’s hybrid OIS may obviate the need entirely for a tripod! The optical-digital system is applied along five axes in HD; horizontal rolling is cancelled out optically while the vertical shake sliding up and down, is offset digitally. In 4K/UHD only optical stabilization is applied owing to the raster’s much finer pixels that effectively preclude the digital approach. This means that DVX200 shooters should well consider various post camera stabilization options, and frame a bit wider in 4K to allow for cropping and stabilizing later. The additional pixels from the wider frame can help reduce the amount of interpolation required in Adobe’s Warp Stabilizer, for example, and produce better results. The hybrid optical-digital stabilizer is especially effective in FHD. At 4K/UHD resolutions the DVX200 applies only optical stabilization. The DVX200’s OIS also provides the ability to fine-tune blur and frequency so doc shooters, say, positioned on a riser at a Flaming Lips concert can tweak the resonating frequency underfoot and remove the vibration transmitted through the platform. Obviously the DVX200 is no ordinary camera! From the operational and workflow perspectives the DVX200’s dual recorder system is very compelling. Borrowed from the VariCam 35 the DVX can record two different codecs, frame rates, and resolutions, simultaneously to separate SD cards. So a typical configuration might be to record 4K/UHD to Card 1 while capturing FHD 1920 x 1080 at 50Mbps or 8Mbps proxy to Card 2. The FHD .mov or .mp4 subordinate recording is very clean and can serve as a viable backup in a pinch. The dual-encoders offer other workflow advantages. 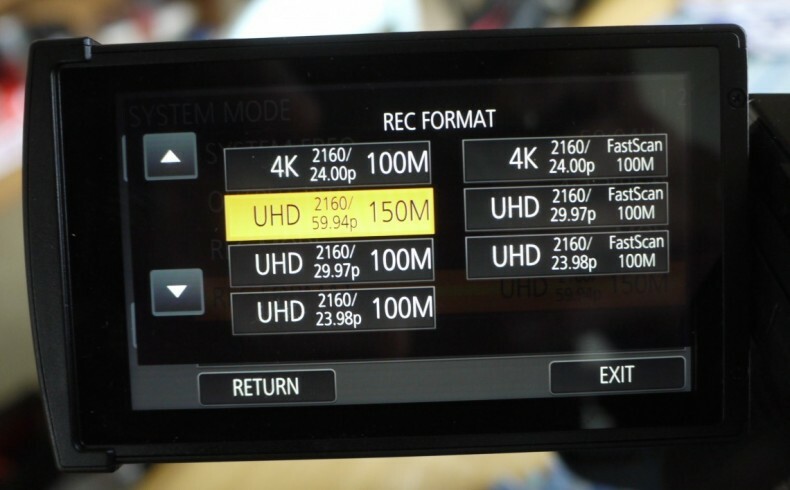 For example the 4K recording may be captured in log while a parallel version recorded in HD REC 709 can reflect normal color and contrast for viewing and dailies. The audio department can begin working immediately with the secondary recording’s PCM tracks without having to wrangle the heavy data loads and potential playback snafus of 4K playback. The DVX200 is certainly a remarkable camera providing the best value in a mid-level 4K camcorder today. Its sophistication and versatility however does pose some challenges especially for broadcasters. Beyond the inability to mount interchangeable lenses there is another notable downside to the camera’s integrated optics. 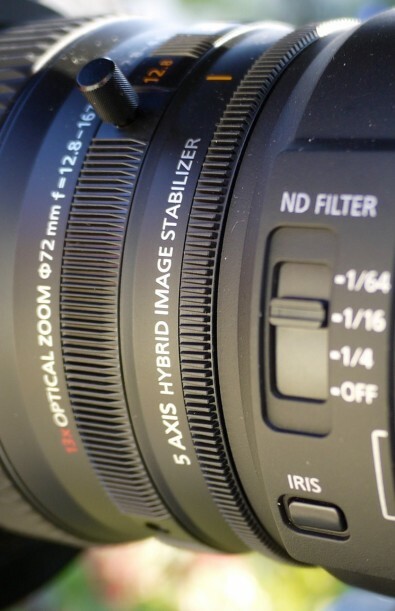 The focus, iris, zoom (FIZ) are effectively tweaked via software; the focus ring spins continuously allowing the servo-controlled lens to ‘float’ and thus maintain critical sharpness throughout the zoom range. While this feature does achieve superior optical performance, it also effectively precludes the setting of repeatable focus marks on the lens barrel, a potential drawback for some users. 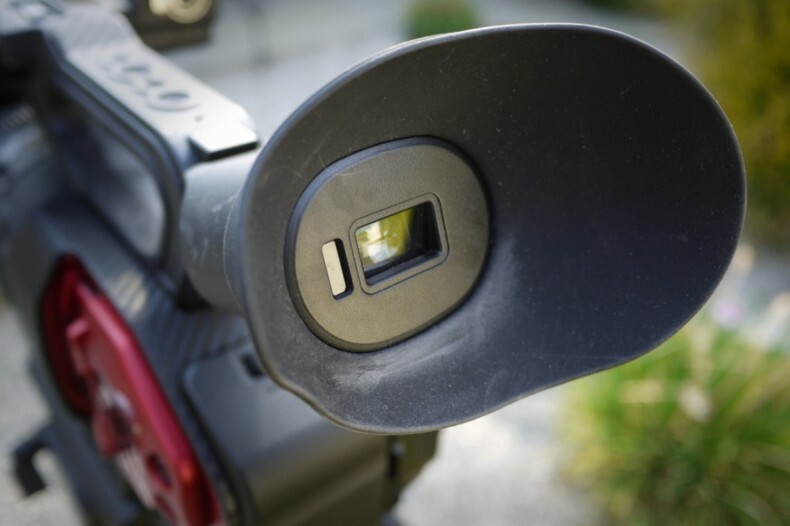 The DVX200 features a familiar uncluttered array of buttons on the side of the camera. The DVX200 addresses the issue via a rather clever automated follow-focus system. Rather than mark the lens barrel in a traditional way, shooters enter the focus points via the viewfinder touchscreen, also inputting the desired speed of the focus change before assigning the now pre-programmed task to a User Button. If in the process the button press produces an objectionable camera shake, a delay in execution may be programmed as well. No doubt an assistant turning a simple focus knob is preferable and more efficient but, again, such operational trade-offs are to be expected in what is after all a very economical high-performance camcorder. 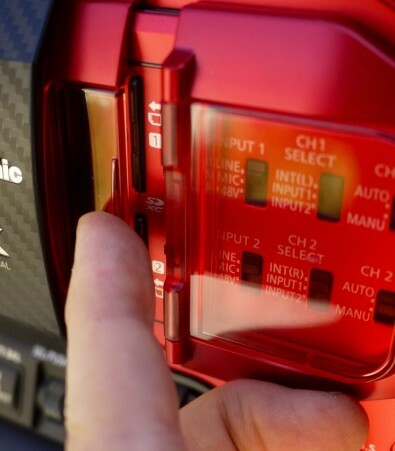 The full function of the AUTO-MANUAL slide switch at the side of the DVX should be self-evident but alas it is not. Zooming in on a bright interior window for example in manual mode will nevertheless produce a change in exposure if the auto shutter is set to ON. This can be baffling and highly frustrating as the status of the auto shutter is not indicated in the viewfinder. Shooters seeking to remedy the behavior would likely have no idea no idea where to begin. The camera run button is where you would expect it to be and has a sliding protective cover. DVX200 shooters should always verify the shutter status in the camera’s LCD. If the status is not displayed then the auto shutter is enabled and the camera will attempt to maintain constant exposure even in MANUAL mode. This anomaly i.e. the non-display of the auto shutter should be corrected in a future version of the camera. The OLED EVF poses a significant challenge as well. While the slide-out LCD finder performs well indoors it is fairly useless outside under bright sun and/or when facing high-gain reflections. The ½-inch OLED EVF displays crisp brilliant images, and it certainly helps under daylight conditions, but its behavior can be frustrating. The OLED EVF is bright and clear but the light cap designed to protect it is too sensitive to a body in the general vicinity of the camera and unpredictably shuts down the swing-out LCD finder! Apparently, according to Panasonic, there is a need to power down the OLED when not in use in order to save power and extend the life of the OLED panel whose longevity is said to be considerably less than a comparable-size LCD screen. The OLED is also apparently highly susceptible to damage from the sun and other strong light sources, which may be further intensified by the EVF’s magnifier diopter. and thus made more damaging. So as a precaution, Panasonic designed a sensor to cap the EVF when the operator’s eye is removed from the camera. This is fine, in theory. Trouble is, the sensor is TOO sensitive so standing behind or anywhere near the camera will open the EVF light cap, which shuts off the flip-out LCD leaving the operator potentially in the blind and in dire straits. When operating outdoors one possible workaround may be to simply turn the EVF skyward to force the swing-out finder to remain on. Or turn the OLED off completely in the menus. Obviously neither is a great solution. Then there is the robo-red metallic finish that may make some professionals nervous. Frankly there are lots of things that get professionals nervous, which is why cameras are usually finished in black. A black finish is less likely to reflect adversely onto a scene or set, and the low-key color doesn’t attract undue attention from thieves and other miscreants. Of course some news directors and producers may like the bright red finish. The camera can be instantly spotted in a teeming crowd so shooters daring a bathroom break in the middle of a 16 hour day can be readily identified and promptly castigated. For most broadcast professionals however the undue attention to self and camera is anathema and can be distracting from the task at hand. Many cameramen and television facilities will no doubt try to cover the red finish with black paper tape to reduce the camera’s visibility. The camera’s sliding plastic doors are fragile and a potential weak point. The camera’s sliding plastic doors are another negative in the rough and tumble world of ENG and unscripted production. One of my long-standing pet peeves is that plastic doors are inherently fragile, prone to breakage, and awkward to manipulate, especially when shooting in winter with thick gloves. The Panasonic DVX200 is an economical high horsepower machine that is nearly perfect for most non-fiction, news, and documentary programs. Lacking the versatility of interchangeable lenses means it is not optimally designed for most professional sports and wildlife applications. Such demands require longer interchangeable lenses and a smaller sensor with greater depth of field. With the ability to operate, frame, and focus quickly even at 4K/UHD resolution, the DVX200 is tantamount to a revolution in a box. For the money it is indisputably the best compact 4K camcorder on the market today.